Finding roof leaks can be a frustrating task for many. As water is pulled by gravity it’s best to use a process of elimination first. First, check in the attic with a flash light to look for active traces of water running down rafters and trace the water trail up to the entry source. This may not be such an easy task as water can transfer from one area to another as it runs downward to its ultimate entry point inside your home. Typically the first areas of leaks are water vent pipes, vent covers, chimneys and skylights. 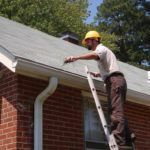 As materials break down or flashing gives way over time due to nail pops or dry caulking this can lead to typical leaks due to a lack of roof maintenance. Many times if your leak is not visible in the attic but is coming in just inside an interior wall you may want to check your gutters. This is another typical area that can leak as gutters fill with debris water backs up, overflows and runs under the first course of shingles or behind rotting the fascia boards. It is imperative that gutters are maintained, kept clean and remain attached tight against the fascia. Always use caution when climbing ladders to check areas of your gutters or roof. It is always best to consult with a trained and licensed professional in these areas. Many roofing contractors offer maintenance options for your roof. As homes expand and contract over 3-5 years after installation you may begin to see “nail pops” lifting shingles. These can also lead to leaks if left unaddressed. A roof is like any other item of your home. It needs to be properly maintained and cared for. If you are unable to find where leaks are coming from, hire a certified and licensed roofing contractor to perform a water test to force the leak. This is done with a water hose starting low and working up to penetrations, flashing, skylights, and chimney’s and ridges. There are many potential reasons for roof leaks. Many times it may be something other than your roof causing water to enter your home. Be safe and always consult with licensed factory certified roofing professionals.